Last week I attended (and spoke at) the MarketingProfs’ Digital Marketing Forum, an annual gathering of smart marketing minds who, for this year’s event, traveled to a snowy Austin, TX to explore what’s emerging in the area of digital marketing. This was my 5th MarketingProfs event (I know I am a veteran) which as usual turned out to be a star-studded gathering with Jay Baer and Amber Naslund debuting their “Now Revolution” book and Ann Handley and C.C. Chapman debuting their “Content Rules” book, both of which I highly recommend. If you’ve ever been to a MarketingProfs event you know that it is a great networking opportunity first and foremost. I took advantage of it and had lengthy discussions with Steve Woodruff about opportunities for social media in pharma and healthcare industries and discussed content marketing strategies with Jeffrey Cohen, the editor of the Social Media B2B blog. So what left the biggest impression for me at this year’s conference? – you ask. Well, several things including the abundance of QR codes popping up in handouts, callouts, napkins, books pages and other physical objects spotting of which was followed by many conversations regarding how to use QR codes for marketing and customer loyalty programs. And rightfully so QR codes are finaly taking off in America with most recent survey from Mobio showing a 1200% increase in QR code usage in the last 3 months of 2010. A lot of great articles including Jeff Korhan’s recent blog in Social Media Examiner & a an earlier one from Mashable go over the QR codes basics, so I will happily refer you to them regarding the history of QR codes, adoption rates and so on. Here I will just list the basics. QR codes (as well as their cousins Microsoft Tags, Datamatix, etc.) are two-dimensional codes that can be generated easily (and for free) and displayed for anyone to scan with their smart phones. QR codes enable easy connections between physical objects and the digital world. To read a QR code you must have a special application called a QR Reader. 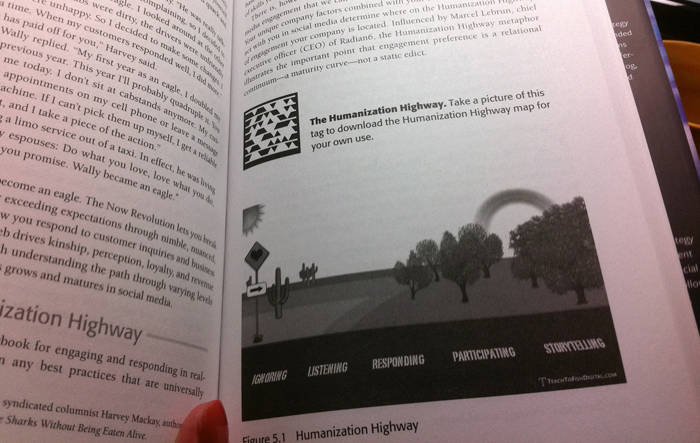 Jay Baer and Amber Naslund incorporated Microsoft Tag ( QR codes’ cousin) as part of their “the Now Revolution” book making it easy for readers to seamlessly transfer from print to a digital experience in order to provide extra value to the readers in terms of links to web pages or accessing additional resources that are easier to consume digitally. What makes QR codes exceptional for advertising is the fact that the recipients of the advertising message are invited to interact with the ad instead of passively consuming its content. 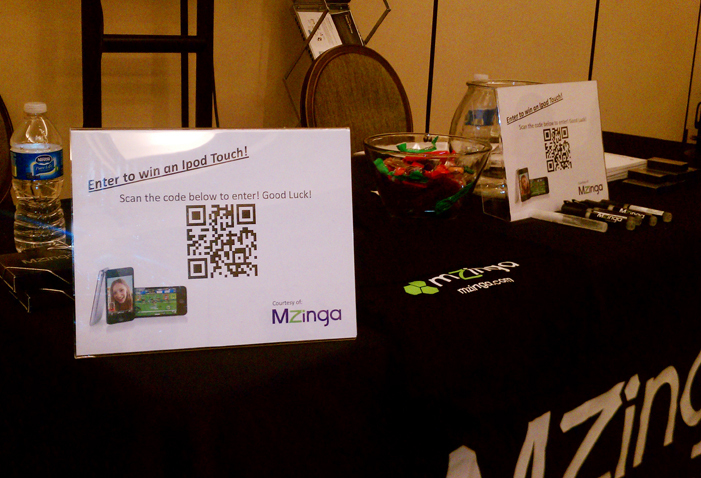 At Marketing Profs conference we saw several uses of QR codes as part of the booth display inviting attendees to scan codes to view additional info, watch videos or enter to win prizes. 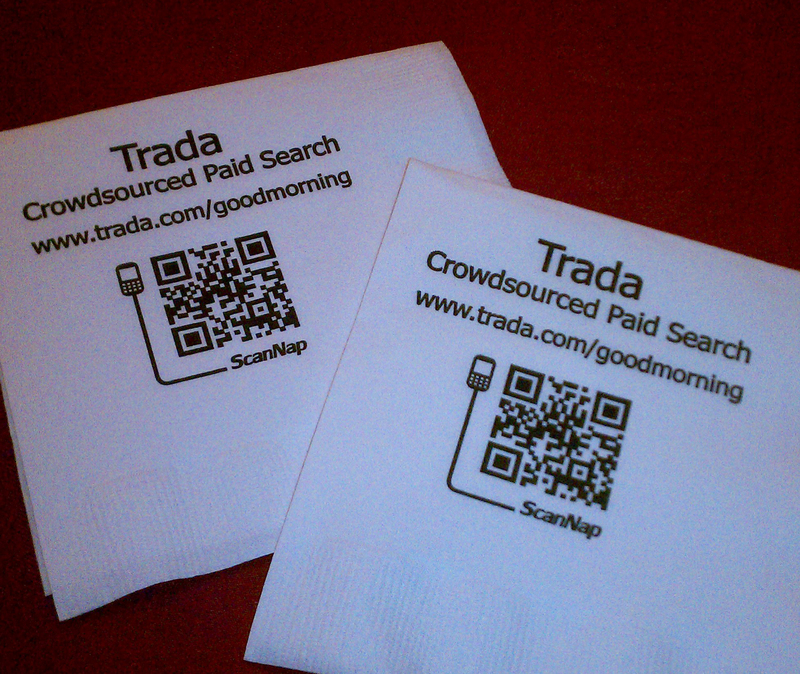 Trada, a crowd-sourced SEM company, made sure no one missed their innovative use of QR codes to promote their business at MarketingProfs event – their QR code was printed directly on napkins used by event attendees throughout the event. Clever! 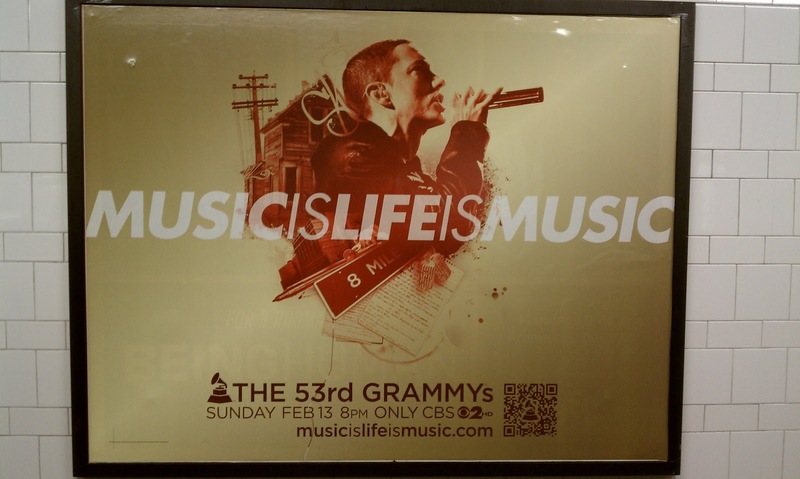 The Grammys have used QR Codes to promote the 53rd annual music awards event on the streets and in subway stations of New York City taking users to an online experience to listen to 30 second snippets of selected songs and vote for their favorite tunes. 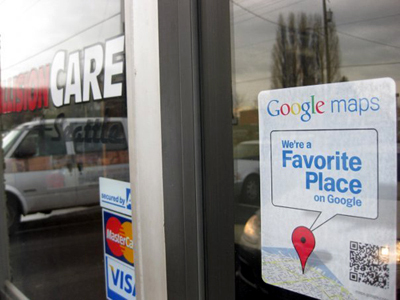 A clever example of using QR codes by small businesses comes from Google’s Favorite Place campaign for which Google teamed up with 100,000 local small businesses such as restaurants to promote their business by displaying large decals with QR codes in their store windows. By scanning the QR code patrons were sent to the Google Mobile directory page for that small business where they could read reviews and other helpful info. 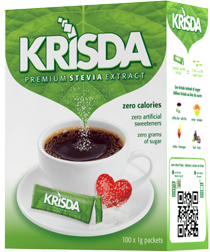 Let’s think big, really big… How about placing a QR code on all products in supermarkets allowing consumers to access nutritional information, recipes and any other pertinent product info. It’s already wide spread in Japan and other Asia Pacific countries. I have not seen a QR code on a supermarket shelf in Connecticut but the creator of the “2D Barcode Strategy” blog did and commented on the experience which should be a warning to all CPG companies to not simply slap a QR code on a packaging of the product or a store shelf advertising, but to think about the consumer experience once they scan the QR code. Best Buy has really embraced QR codes in a consumer-friendly way by including QR codes on their in-store product price tags as well as weekly sales flyers delivered to consumers with your Sunday newspaper. The goal: make it easier for shoppers to access extra product info. (in store) or to complete the purchase online (store flyer). 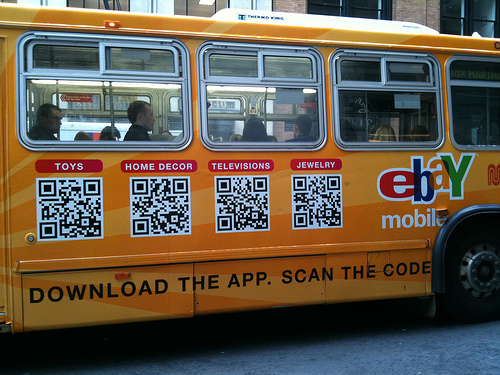 And finally Ebay is experimenting with QR codes on busses to encourage passengers to do a little shopping to kill time while commuting. Very smart! QR codes do not need to be displayed on physical objects such as collateral, store windows or busses. They can be shown on television screens as part of a broadcast. The Weather channel is taking advantage of it by displays large QR codes during their weather broadcast to entice users to download their mobile weather map. Brilliant. Want to be paper-free while traveling? 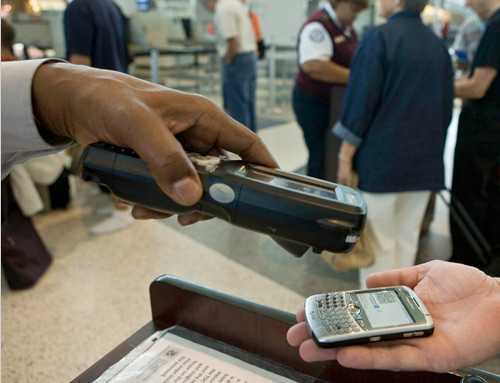 QR code saved to your smart phone can easily replace your boarding pass. In the US Continental and American Airlines are using them already to free their passengers from caring paper boarding passes. Recently I have been asked to help evaluate candidates for an open position with my employer. 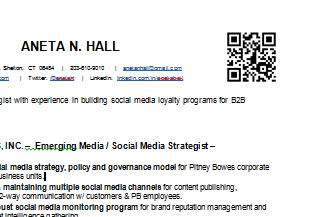 We received dozens of resumes but only one of them included a QR code clearly visible on the front page. Guess which resume I looked at first? I am looking forward to reading reports that show results of QR-code enabled campaigns. As with all web-enabled marketing effors consumers’ interations withQR-codes can be monitored and reported on including scan rates, time on site, navigation paths and most importantly conversions. Have you seen any interesting implementations of QR codes for marketing or customer service? Share them in comments. QR codes help keep us “green” to. Imagine if there were no more printing of User’s Manuals…you could just have a QR code on the outside of the box and download the directions. Great post, Aneta. I too have a few more examples (from own experience). 3. In the Netherlands we often use http://www.9292ov.nl for public transport details (combination of train, busses, etc). Last time I used it, it not only displayed the travel details I asked for on my PC screen, but also a QRcode. After scanning it, I discovered that all travel details were on my android, including earlier/later departures as well as maps for the small distances I had to walk. I thought that was absolutely brilliant. Great post Aneta and good to see that people can recognise a useful tech. Just a couple of problems though! I know you refer to the MS Tag in the paragraph, but you shouldn’t refer to it as a QR code in the image caption – it helps to confuse an already confused user base. Also, the ‘For Sale’ sign has a Datamatrix code on it, not a QR code. 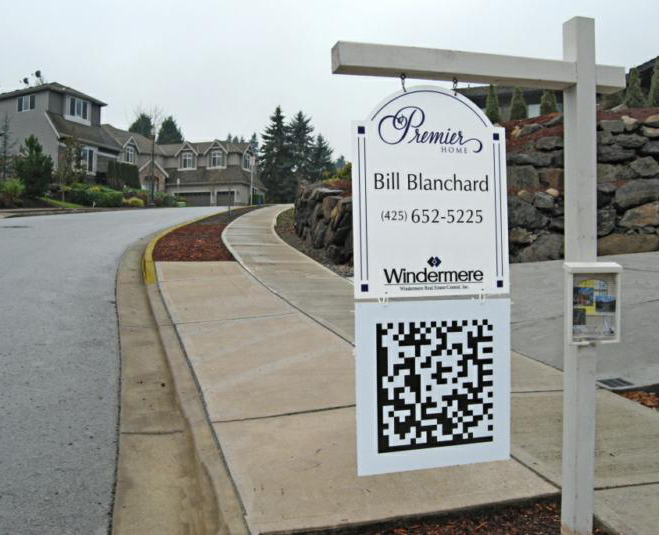 That surprised me as most realtors are using the QR code type – very odd to be using Datamatrix. Hi Steve. What would I do without your careful review? I will correct the post. Thanks! Great post! We at Napkins-Only.com (e.g. 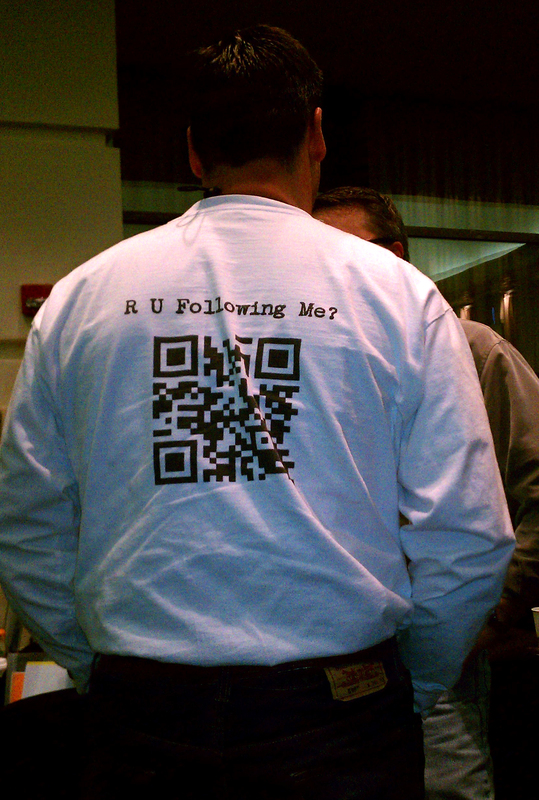 : ScanNap QR Code napkin pictured above) thank you for the positive mention. Interestingly, we’ve recently developed an invisible QR code ink. 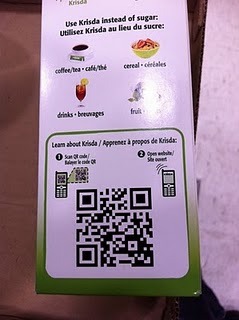 The ugly QR code bar codes need not be present as part of the printed copy. The ink kills the visible white light spectrum while amplifying the infrared spectrum. Essentially, one could print an invisible QR code on a black napkin in a dimly lit bar or night club and have the scan successfully resolve under these extreme conditions. Pretty cool stuff! Thanks again Aneta!